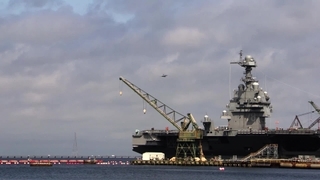 NEWPORT NEWS, Va. (Aug. 10, 2016) -- Huntington Ingalls Industries (NYSE:HII) announced today that its Newport News Shipbuilding division has successfully tested the Precision Aircraft Landing System (PALS) on the aircraft carrier Gerald R. Ford (CVN 78). PALS is a radar system that provides final approach and landing guidance to aircraft to ensure successful landings on the flight deck. A special instrumented F-18 Super Hornet flew within about 500 feet of Gerald R. Ford 10 times during the testing, which verifies the proper functionality, alignment and operation of the PALS equipment and its subsystems. 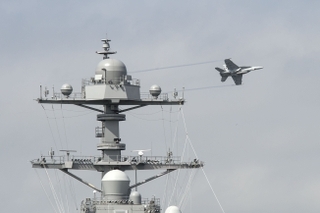 While the PALS technology is used on Nimitz-class carriers, Gerald R. Ford’s system is upgraded and modified for the new class’ island location and other design and technology changes. The dual band radar, also new to the Ford class, supported testing of the PALS.